The C-Suite “customer ” role is massive. Our CCO Exchanges have taken deep dives in analytics, AI, and omni-channel customer experience. Though also relevant for the CXO, topical content at the CXO Exchange will lean more toward understanding customer touch points, the innovation required to break down silos and reinvent pain points and how to leverage design as an organization-wide tool. Moreover, how do all experiences created by an organization, from analog to digital and from marketing touch points to customer service touch points, speak with one, holistic service experience. Another aspect more unique to the CXO role is employee experience. The holistic view of all things experience is inclusive of the internal customers as well. 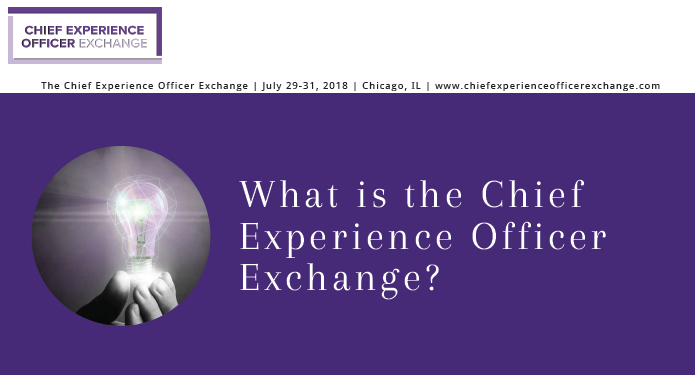 The Chief Experience Officer Exchange is a unique opportunity for 50 CXO's to get the chance to sit amongst each other for 3 days network, benchmark, and discuss best practices. The exchange programs are built and led by a senior audience to be more than a conference. It truly is an experience and simply can't get anywhere else.